Discover new and creative building ideas, tips, and tricks for your LEGO® bricks with this #1 New York Times bestseller. 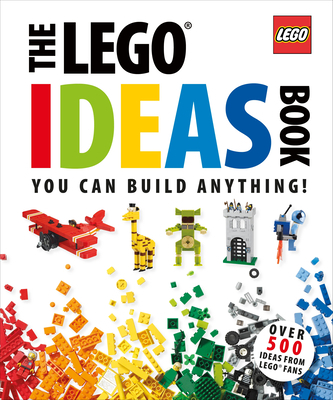 With more than 1 million copies sold, The LEGO Ideas Book is perfect for LEGO fans of all ages. Wired.com says, "If you're a LEGO fanatic (or know one), The LEGO Ideas Book is worth taking a look at." Divided into six themed chapters—transportation, buildings, space, kingdoms, adventure, and useful makes—each section contains basic templates of key models to inspire you to create your own. Hints and tips from Master Builders can help you turn your classic car into a race car or add a bridge to your castle. Don't be concerned if you haven't got all the bricks you need: this book also shows how to simplify details, making this a user-friendly guide for any building ability. A hit among parents and in classrooms for inspiring imagination and creativity, The LEGO Ideas Book has won a Teachers' Choice Award, Parents' Choice Award, and is a Children's Choices Selection from the Children's Book Council and International Literacy Association.